Looking for a Custom Katana? Buy or Make One! If you are on the hunt for an affordable custom katana look no further. Occasionally I’ll meet someone who wants to break out from the norm and buy a katana that is rarely seen anywhere else. Most people think that to buy a custom katana they’ll need to drop thousands of dollars….nope! Small batch custom katana forging is a huge trend right now meaning your chances of finding a unique blade at a reasonable price is pretty good. 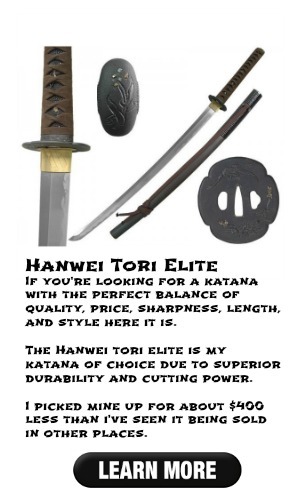 The first option when shopping for a custom katana is a pre-forged one, meaning that it is already made yet wasn’t produced in large batches and usually doesn’t carry a brand name like Hanwei or Thaitsuki (want to have one made from start to finish? Read on I’ll tell you how you can). These custom katanas are usually made in smaller forgeries allowing them to determine the style of the blade the wish to create. I usually buy my katanas from SOTE but recently came across this new distributor which offers a pretty unique selection of various swords ranging from katanas and tantos to Chinese and medieval swords – Swords of Northshire. The Senshi authentic Japanese katana is a beautiful sword with a unique crackled style wood saya. I am a huge fan of the brown as you already know if you’ve read my previous blogs, so this katana is right up my style. The 12 stage polished finish gives it a nice sharp look especially in contrast to the tsuba which has a more flat ominous looking style. Aside from the looks of this katana there’s quite a bit of structural advantages to it starting with the composite. The sword features a hand forged T10 steel blade. When it arrived it was already sharpened and even after quite a few uses it has remained as sharp as when I got it. If you’re still not sure which steel is better here’s a chart to help you determine the strengths of the various steel grades. Additionally the blade is clay tempered full tang, meaning that the blade extends completely back through the entire tsuka. Full tang blade provide more durability and leverage than blades that start mid way through the tsuka. Not to mention they are a lot safer to use due to reduced chances of them breaking (something that happened to me earlier with my first katana). The weight on this sword has a great balance as well, it comes in at under 3 lbs. (2.8 to be exact) but the way it’s made the balance allows for easy maneuvering with it. This katana hasn’t had as much field testing as some of my other blades but so far I’m pretty happy with it, another beauty added to my extensive collection! Not to mention you can get custom engraving on it as well. If you’re looking to stand out on the battlefield (or class which is more likely than a battlefield) with a custom katana that very few will have, then I’d recommend going for the authentic Senshi katana. UPDATE: I received a few emails asking where to find the Senshi, unfortunately Swords of Northshire has sold out of their Senshi custom katana and I’m not exactly sure when they’ll start forging another batch of them. They still do have quite a few other options if you’re looking for a custom katana though, some with some very beautiful saya woodwork engravings so I’d recommend browsing their selection. Still Not Unique Enough for You? Make Your Own Custom Katana! Swords of Northshire are the first sword dealers I’ve seen to do this…Create your own katana from start to end. I’m talking about selecting the blade forge you want, the groove, the saya, the tsuba, the finishings, everything is as you want it! I was ecstatic when I found this out, I really am able to get a sword that is one of a kind and at a very reasonable price. Below is a screenshot I took as I went through the process of buying my first truly made custom katana. There are a vast amount of styles you can create and the great thing is you determine the quality starting with the blade compositions you select. Clay Tempered of course which is best (and most expensive) or you can go with the lesser priced Carbon steel. The starting base price for a custom katana is $190, from here the cost depends on how much you want to upgrade the blade, fittings, and saya. I’ll walk you through the steps of making your own custom katana using Swords of Northshire’s katana building program. Step 1 – Select whether or not you want the blade sharpened before it leaves the forgery or will it be a wall hanger therefore you prefer a dull blade for safety reasons. 1060 Steel: A good balance between hardness and durability. Used on light to moderate targets (foam rolls, rolled mats). Folded vs. high carbon steel: the folded steel requires a more lengthy process where the steel is folded over itself and hammered multiple times to spread out the carbon content which not only helps remove impurities but also develops a grainy pattern on the blade. 1095 Steel: Hard steel, primarily used for cutting heavier targets yet it is more susceptible to breaking due to the lack of flexibility in the steel. 9260 Spring Steel: The same steel used in the springs supporting the suspension on your vehicle, this steel has an extremely high durability rating and can bend and spring back to the normal curvature with very little chance of breakage. 1095 Steel: A very hard blade that will hold an exceptionally sharp edge however is also very brittle due to its 0.95% carbon content. If you go with this blade I’d suggest getting the folded steel version. Clay Tempered Blades: Clay is applied to the blade before the quenching process causing the blade to undergo differential heating process, which creates a hard edge for heavy cutting yet a more flexible back for absorbing shock. This method creates a beautiful, genuine hamon line that most high quality custom katanas will have and others will notice. Tamahagane: Made from an iron sand called ‘tamahagane’, these blade types are the most authentic samurai blades since they follow strict forging methods and usually take almost a month to finish the polishing. If you want a ‘real’ authentic katana then this is the blade type you want. Step 3 – Blade length, do you want a katana (28″), a Wakizashi (20″), or a Tanto (13″). Almost all my swords are katanas, I have a couple Wakizashi’s and one Tanto. Step 4 – Groove or no groove? Otherwise known as the ‘bo-hi’, a line carved out of the blade allows for the blade to be lighter weight. For some who are used to practicing with a non-grooved blade, I’d recommend staying without the bo-hi since the weight difference may throw you off for a bit until you get used to it. Step 5 – Hamon, or the ‘wavy’ line along the blade. You can have an artificial one placed on the blade for looks however the true hamon will come with a Tamahagane blade. I personally like the irregular style pattern seen below. Step 6 – Select the color of the saya (scabbard) for your katana. This is what the katana slides into when not in use, kind of like a sheath of a knife. There are 6 colors currently to choose from. Step 8 – Selecting a tsuba is one of my favorite parts when I have them make a custom katana for me. It’s one of the most visible parts of the sword that really allows for you to get creative with it. There’s a pretty big selection so just choose something that fits your style. Step 9 – The Habaki and Seppa are the components that prevent the blade from falling out of the saya. Nothing too fancy with the customization here. Step 10 – The Fuchi & Kashira are another one of my favorite parts to choose. These are the end fittings that go on both ends of the handle of the blade. Step 11 – The Same’gawa is just the wrap that goes around the handle. Step 12 – The Menuki fit under the tsuka and add some lift on the handle to allow you a better grip on it. There’s a few neat options here as well in terms of customization. Step 13 – Almost done, time for the handle wrap which if you’ve been reading all my other posts here you know what my preference is…yep brown leather! Step 14 – The final touch on your custom katana is the engraving, you are not limited to letters but they’ll also engrave designs, kanji symbols, etc. So in just 14 quick simple steps that are very easy and pretty much self-guided through the custom katana builder program Swords of Northshire has you can have your one of a kind katana delivered to your door. Interested? I couldn’t resist and have my second one on the way! Now for you Walking Dead fans, I have the perfect katana for you if you can get it before they sell out. Read my review on Michonne’s katana. My passion for katanas also extends into everyone’s favorite show, The Walking Dead! My previous reviews were more focused on the actual utility of your average katana. I rarely ever find ‘novelty’ type katanas to be of any quality therefore don’t blog about them. Michonne’s katana from The Walking Dead is an exception to this. The craftsmanship of this sword is great. The colors used in the wrap of the tsuka are stunning and as you know, I favor the leather wrap over the nylon. Not only is Michonne’s katana awesome to have as a memorabilia piece from my favorite show but the katana itself is built for functionality. The blade is sturdy and the wooden saya is quite durable and provides a carry strap. The tsuba is made of bronze with a nice nickel plated covering that gives it a sturdy feeling. I think the design on it is pretty cool as well, almost a ‘biohazard’ type look to it, perfect for the zombie apocalypse theme. The only downside to this is that it does NOT come sharpened, so if you are intending to use it in practice for cutting bamboo or foam rolls you must get it sharpened. I did end up getting mine sharpened because I was interested in seeing how well it cut, it actually is pretty smooth for a novelty blade. I’ve only used it on foam rolls so right now I can’t give you a feel for how it works with bamboo. I luckily already purchased mine but I have heard that this katana was a special release and only 2,000 were forged worldwide. I’ve seen it sell for $200-$300 and I have a feeling that once these 2,000 sellout that some will hold on to them while they increase in value and flip them for a few extra hundred. Just how memorabilia like this usually goes. If this is something you are interested in I’d suggest hopping on this deal quickly before they sell out. SOTE does have this sword on sale right now for only $170. The Walking Dead edition is just one of many feature film katanas made, which leads me to my next post on the top 5 movie katanas. Get Michonne’s katana here before they’re sold out!